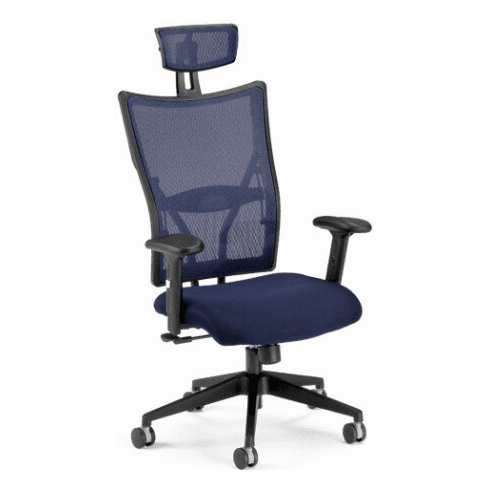 This contemporary executive mesh office chair from OFM features a thickly padded molded foam seat with your choice of stain resistant mesh fabric or leather upholstery. The backrest features screen mesh for the ultimate in support and temperature control. Other features include a screen mesh headrest, built-in adjustable lumbar support, 360 degree swivel, pneumatic seat height adjustment, tilt with tilt lock and tilt tension adjustment, synchronized seat & back adjustment, adjustable height armrest, waterfall seat edge and a five star base with standard dual wheel casters. Optional sled base mesh side chair is available for a matched set. Additional caster options are available for this chair. This chair meets or exceeds ANSI/BIFMA standards. Dimensions: Seat Size: 21"W x 20"D. Back Size: 24"W x 19.3"H. Seat Height Adjustment: 18"-20"H. Overall: 57-60"H x 26"W x 22"D. Limited lifetime warranty from OFM. This chair normally ships within 1-2 business days from our NC warehouse.